The USMLE- Easy Question Bank from McGraw Hill has now been added to the growing list of online library resources that UMHS subscribes to for use by our faculty and students! USMLE-Easy provides powerful customization tools and more than 11,000 questions covering all the disciplines and organ systems included on the USMLE Step 1, Step 2 CK, and Step 3. USMLE Easy allows you to easily master concepts based on your individual strengths and weaknesses. You can prepare for the USMLE with a comprehensive personalized practice/ test prep experience. Your personalized dashboard displays your latest activities and scores allowing you to constantly track your progress, and easily resume your studying exactly where you left off. A Personal Study Plan feature is included which allows you to progress according to your customized study schedule. An individualized skill report provides a full analysis of your proficiency in every subject area tested by the USMLE. This enables you to focus your prep efforts, overcome problem areas, and utilize your study time more effectively. You can view your test results easily after completing each test and access detailed explanations for any question. You will also receive feedback statistics on your total test performance. Check your email for notification about your personal account and how to access the new USMLE-Easy sites. Check it out and prepare for Finals ~ go to the Library Home Page and click on the link. 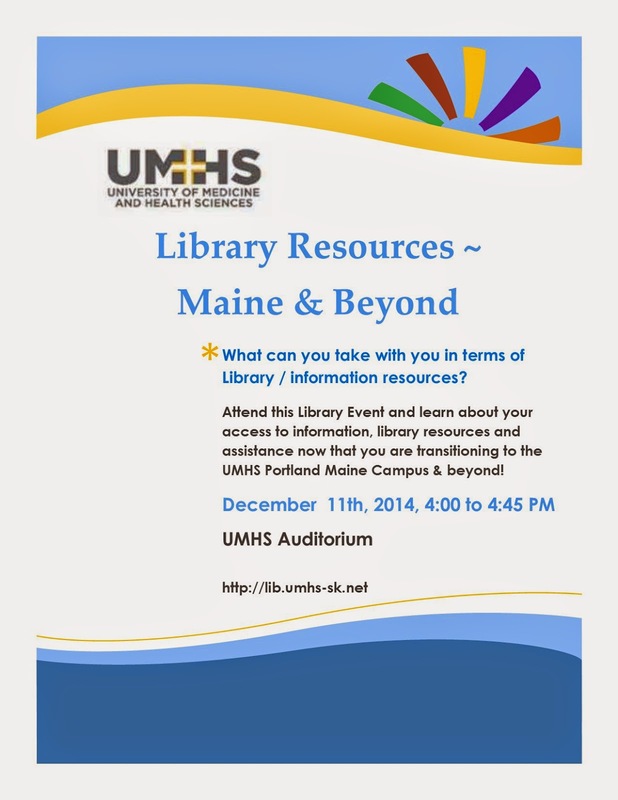 Library Event: "Library Resources ~ Maine & Beyond"
Attend this Library Event and learn how to access the online information resources that the Anne Ross Library provides for all UMHS students once they transition to the Portland, Maine campus and beyond. Dean's Grand Round: "Life After St. Kitts - Transition to Maine"
“Life After St Kitts - Transition to Maine”. and all faculty and students are invited.